So far, I'm not loving the Newbery winners. This one frustrated and disappointed me, and was not loved by my 7-year-old audience either. The book is divided into four sections, focusing first on the titular mouse, then on a very evil rat (not Disney-style fun evil, but sadistic, sociopathic, soul-breaking evil), then on a little girl who has beaten to near deafness, and finally it moves to the climax where all the characters are brought together. 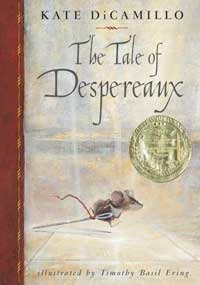 At about the halfway point we began to wonder if we were ever going to hear from little Despereaux again. Although I was interested in the girl named Miggery Sow, who I thought had the potential to be a stronger character later in the book (spoiler: no), my listener just wanted to get back to the mouse. That took FOREVER. And let me be clear: there isn't a single likeable character in the entire rest of the book. That means that for more than half the time we were reading this book, we were reading about characters we either disliked or feared, and wondering when we were going to rejoin the only likeable character in the book. On that basis alone, I would not recommend this book. The themes of the book seem to be, predictably enough, the triumph of light over darkness and the triumph of love over evil. Also, soup. Presumably to illustrate the stupendous power of light/love, the dark parts were very very dark. It was especially hard for me to read aloud the parts where Miggery Sow was beaten anew on her already disfigured and half-deaf ears and cries out in pain. Or was it worse when she was told she was too stupid or too ugly to amount to anything? In addition to Miggery Sow abuse, there is the truly psychologically twisted rat, and all the parents are awful (sentences young son to death), awful (more interested in own looks than son), awful (sold daughter for cigarettes). Or dead, one is dead (spoiler: yes, it is the princess's mother!). The tone of the book is forced charm, and includes passages that address the reader directly ("Reader, do you recall the word 'perfidy'? As our story progresses, 'perfidy' becomes an ever more appropriate word, doesn't it? "), ugh. I skipped those wherever I was nimble enough to see them coming. Almost everything about the book seems overwrought, from the recurring reminder of the restorative powers of hot soup to the unrelenting, backstabbing horribleness of Despereaux's family. The mouse council, which includes Despereaux's father, sentences young Despereaux to the castle dungeon to be eaten alive by rats for the crime of being different. His mother is too concerned with her own physical appearance to even care. The circumstances were so over-the-top awful that they became maudlin verging on tacky. But beyond that, I was disappointed in the messages that the book had to offer. The reader is meant to identify with Despereaux, the only sympathetic character in the book, but his quest is to take it upon himself to rescue the princess (with whom he is in love), despite the extreme unlikeliness of success. Admirably, he overcomes his fears, sticks to his mission, and shows great courage in the face of harm. All the pluckiest features we think we want in our own children. However, in my opinion, the model of single hero who takes it upon himself (it's almost always a him, not a her) to save the world is not a healthy one. As Colin Stokes so wisely points out, these aren't the skills we want for our children as they go out into the world. We want them to know how to work collaboratively, to be team-builders who inspire the best in people. We want them to make plans that have good chances of success (an undersized mouse alone in a dungeon with a sewing needle for protection is not what that looks like) and don't put their own well-being in unreasonable danger unless absolutely necessary. Despereaux does not show good judgment. His success was a complete fluke, and I would not want my child to take the one-in-a-million chance with her own safety that he took with his. In fact, I have told her many times that if she feels in her gut that she is in an unsafe situation, she needs to get herself the heck out of it any way she can as fast as she can. I don't even want her to pause to consider forcing herself down whatever dungeon stairs she is facing. And if she meets any real-life Chiaroscuros, I don't want her to linger long enough to find out if he is really motivated by a love of light, I want her to run in the opposite direction and never look back. And finally, Princess Pea. Pea, you made me realize that we are living in a time where it's no longer good enough for the princesses in our stories wait around to be rescued by the little boys. Pea, my seven-year-old daughter was disappointed in you (she actually asked me why the princess didn't fight the rat), and I am so grateful that the other books and movies in her life have led her to expect more than the passive resignation to one's fate that was your primary feature. Pea, my daughter does not want you to be her prize for completing her quest. Maybe in our next book the princess will rescue herself — or, even better, be just one part of the heroic team that saves the day.